Make sure your lunch is full of colour with this vibrant falafel recipe that tastes as good as it looks. 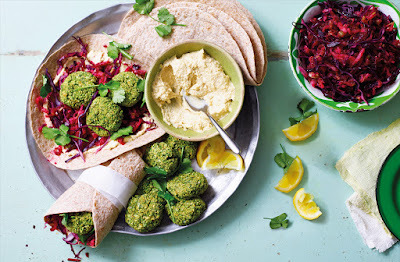 These healthy wraps are filled with creamy houmous, gorgeous green pea and coriander falafels and a crunchy beetroot and apple slaw, for an easy vegan lunch. Preheat the oven to gas 6, 200°C, fan 180°C. Line a large baking tray with baking paper. Add the peas, chickpeas, cumin, flour, spring onions and most of the coriander leaves (reserving a few to serve), to the bowl of a food processor. Season and then pulse for 30 secs or until the mixture just comes together. Scoop out 2 tbsp portions of the mixture and roll into balls with damp hands. Put on the lined baking tray and flatten slightly. Repeat with all the mixture to make about 12 falafels. Bake for 15-18 mins or until the falafels are firm to the touch and lightly golden at the edges. Meanwhile, add all the ingredients for the slaw to a large bowl and toss together with a little seasoning. To serve, spread the houmous over the tortillas, then top with the slaw and falafels. Garnish with a few coriander leaves before folding in the bottom and sides to enclose the fillings. Serve with lemon wedges to squeeze over the top. Tip: The falafels can be made in advance and served cold. Bake as above, then leave to cool completely before storing in an airtight container in the fridge for up to 3 days. The full wraps can be made up to 1 day ahead but the slaw will lose some its crunch once assembled. Roll up to fully enclose the filling, then wrap well in foil and chill until serving.